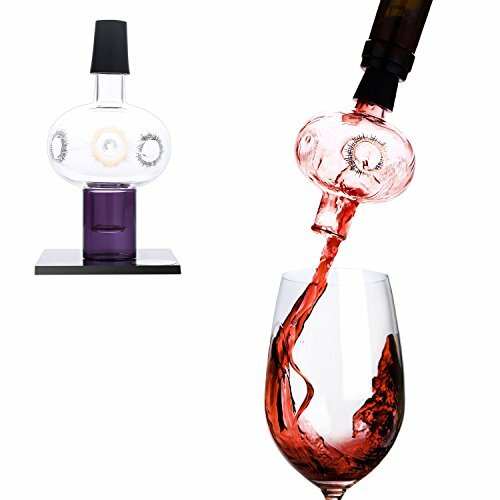 Lovinpro Wine Aerator Pourer can be inserted into your wine bottle directly and aerates wine instantly When you pour wine, You don't need to wait for a long time. The unique air intake system allows the occlusive wine to regain its vitality and release the fragrance. The Gold Pattern Wine Aerator Pourer can let the wine breathe and Double the Value of your wine. Lovinpro Wine Aerator Pourer is not only showing the perfect quality of wine but easy to use. The rubber stopper create a leak-free seal for wine bottles of all sizes. It's not only a aerator but a pourer. Each product through a rigorous quality inspection before shipment. Enhance your wine flavors instantly : Whether you are a wine connoisseur or the host of your first dinner , this in-bottle instant wine decanter will enhance the experience of any wine. Keep your tabelcloth clean :no wine stains. Red wine aerator, Unique design, to prevent splashing. If you have any questions about this product by Lovinpro, contact us by completing and submitting the form below. If you are looking for a specif part number, please include it with your message.